It’s Day 3 of our United States Association of Cider Makers’ #PickCider recipe showcase! We’ve already shared a tangy cider BBQ sauce recipe and an easy-as-can-be recipe for cider-spiked pickles. 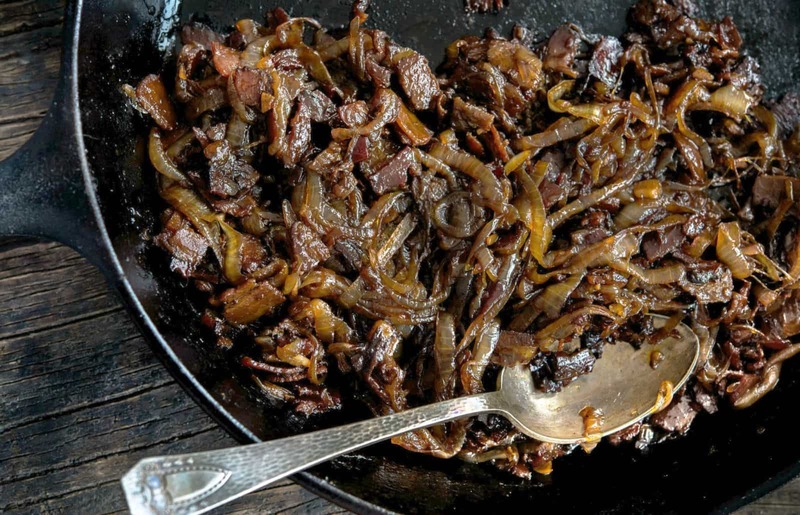 Next we turn to a recipe that will make your favorite savory dish sing: caramelized onions with cider. Everything tastes better with this savory, sweet, hard cider-kissed topping. Generously garnish pizzas, chicken, steak, fish, tofu and salads with the onions, or try layering them on sandwiches and quesadillas. Caramelized onions are a must-have addition to cheese and charcuterie boards, too. With just four ingredients and four steps, this recipe can be prepared by even the most novice chef. Add some pizzazz to your dishes and whip up a batch today! Heat a large heavy-bottomed skillet over medium-high heat. Melt the butter. Add the sliced onions to the pan, season with salt and stir them gently to coat with butter. Cook until onions are lightly browned and starting to soften, about 5 minutes, stirring occasionally with a wooden spoon. Reduce heat to medium/medium-low and cook, stirring occasionally, until the onions are chestnut brown, about 40 minutes. Scrape the browned bits from the bottom of the pan from time to time. When deep golden brown, add the hard cider. As the liquid bubbles, scrape up any browned bits and stir it into the onions. Use additional liquid as necessary to scrape up all the fond. Salt the onions to taste.